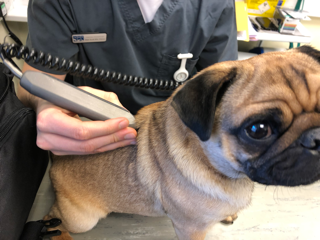 Yesterday Milo had his check up with the physio. We have been working on strengthening his legs and improving his gait. 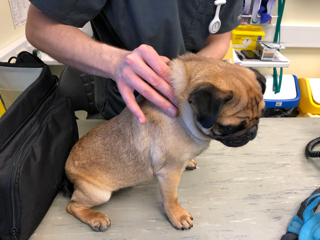 The physio and the specialist (who popped in to see him) were super impressed with his progress. His back legs have improved massively. He is able to stand upright for long periods of time on his back legs, taking all of his weight on them. He is walking almost “perfectly” with minor catching of his nails. He can maintain his balance on a wobble board. He is able to push off from sitting to standing with little effort. The downside is that he is now trying to jump up onto furniture as he is strong enough to push upwards on his legs. We are now tasked with doing figure of eight walking, which means he will have to change direction and transfer his weight quickly. His progress is amazing to see. 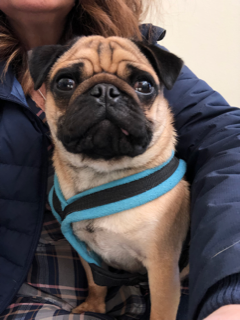 Milo came into foster at 10.5 months old (he will be 1yr on 24th March). He was attacked by a bull breed at 5 weeks of age and this has led to various problems. His jaw was broken and he now has a slightly lopsided smile where his tongue pokes out slightly. His spine is severely compressed. An MRI shows that this is an historic problem, possibly due to trauma, but bone has grown to fuse and stabilise the spine. Surgery is not required nor can it be performed. He has a slightly wobbly gait which does not slow him down at all. He is very energetic and extremely playful. His exercise must be limited and managed carefully. Possibly due to his past he is highly strung and extremely noisy. He would suit a home where someone is around a lot of the time and has the time and patience to train Milo. A laid back dog would be beneficial to help to calm his youthful exuberance. Whilst he is totally continent he has other ideas of toileting so belly bands are a must. Please note all applicants will require a home-check to be considered. 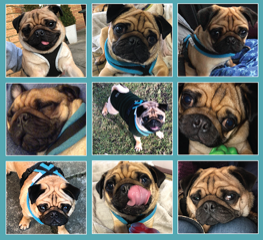 You will remember that Milo had his MRI scan two weeks ago. The scan showed compression of the spine and his cord is severely pinched. There is no surgery that can help him, in fact it would probably paralyse him. Over the last two weeks he has had continual assessment of his walking and his bladder to check for any possible worsening of his condition. We are pleased to report that all seems stable. His legs have strengthened and his weight has been drastically reduced to negate any problems caused by being too fat. He is not incontinent – merely peeing inside the house due to still being a puppy. Today he underwent laser treatment along his spine to try and stimulate his nerves and he also had a physio session. Moving forward he is to undergo a 4-6 week programme of physio (all home based) to try to correct the way he puts his feet down. He will return for a check up on 18th March and again before any adoption. The future does indeed look bright. With careful management, limited exercise and no sudden or jolty movements, Milo ‘should’ remain mobile. 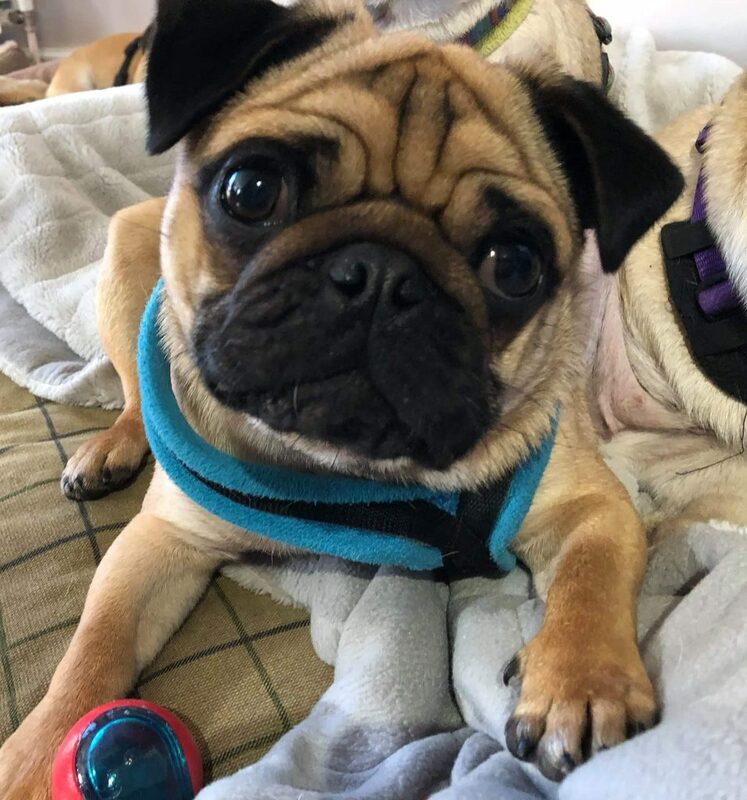 A beautiful boy who will soon be looking for his forever home! 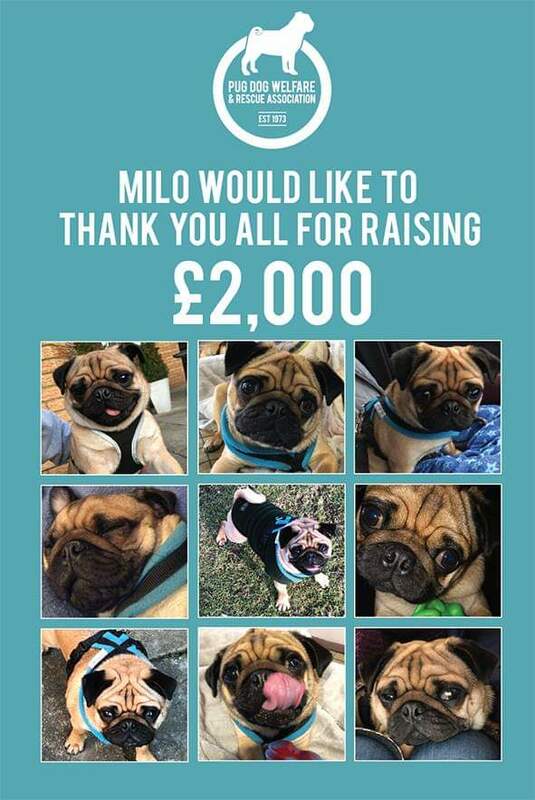 Milo would like to thank you all for raising the £2,000 necessary to fund his scan. Milo was desperate for an MRI. 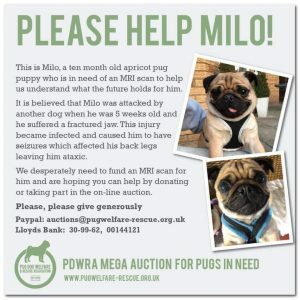 We needed £2,000 to pay for Milo’s scan. This entry was posted in Blog, Fundraising on 19 March, 2019 by Janet.